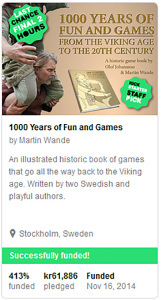 1000 Years of Fun and Games is a historic game book written and illustrated by Olof Johansson and Martin Wande. Two Swedish and playful bearded men. These games have entertained our ancestors for hundreds of years and we have put a great deal of time and effort into this. Olof has gathered his reasearch from over 25 years and combined it with both our practical knowlege of how these games work. We have only chosen games that are fun and playable that we personally enjoy. The rules should be considered more as guidelines, so go ahead and change them as you pelase. Olof Johansson and Martin Wande have spent over 25 + 15 years practising, teaching and researching ancient games and sports. Olof is the historical expert and Martin is an illustrator and information designer. With our special powers combined and many playful years together we finally made this book a reality and hope you enjoy it too. We have been working on the book on and off for many years. In the early summer of 2014 the book was nearing completion but we didn’t have any publisher. October the 21st we started this Kickstarter campaign for people to pre order the book so we could start the expensive printing process our selves. 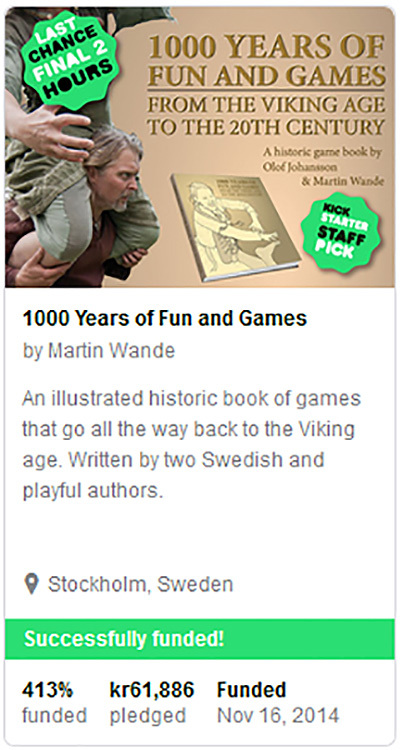 In only 44 hours we had passed our goal and it went on to sell over 270 books before it even was printed. This made it possible to print two editions, one in English and one Swedish.